Hi everyone! I say this every month don’t I? How’d it get to be _________! In this case, March! I still have Winter new stuff to stamp and play with! haha Add it to the stuff from other years, right?! Anyway, this is to cute not to post quick! 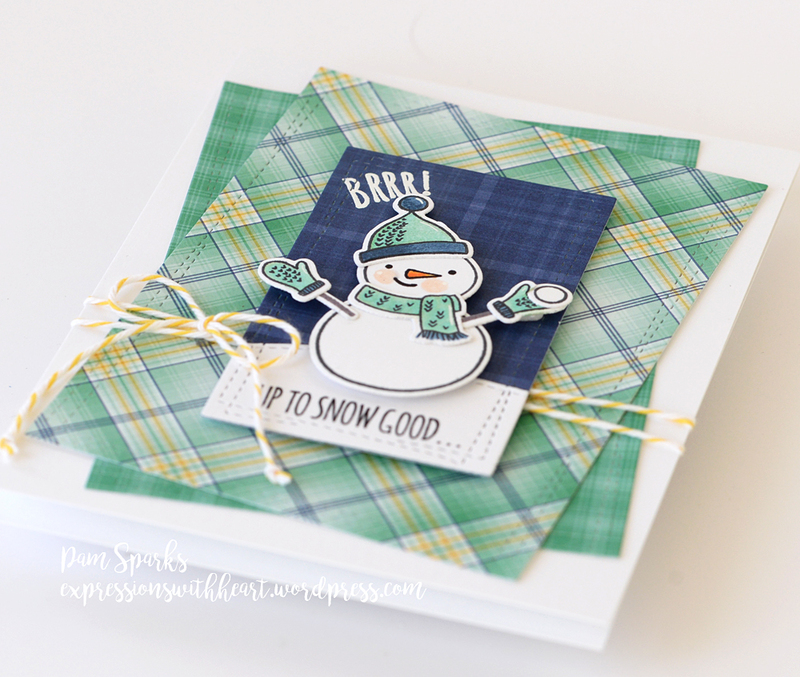 This card and the tag coming up are from the Snow Buds set by Essentials By Ellen. Pattern Paper is from Lawn Fawn. Doodlebug Twine, another staple… HERE. I’ll just call him pail head! I guess all the hats are being used. haha I had to add hearts for buttons. 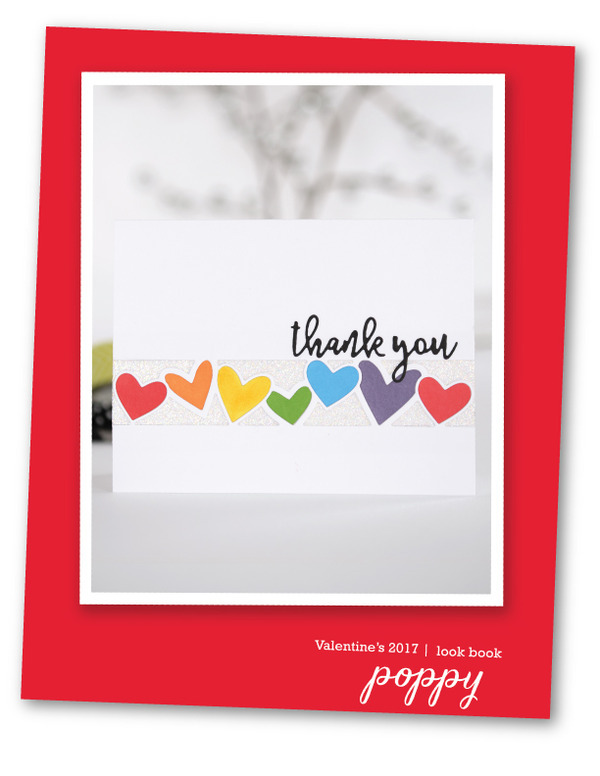 The love tag is from poppystamps. It’s almost that time of year to say good-bye Winter. These guys are gonna melt! lol Thanks for stopping by and hope we made you smile! 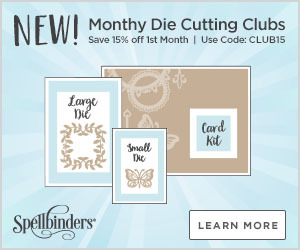 Adorable stamp set and love the sentiments! 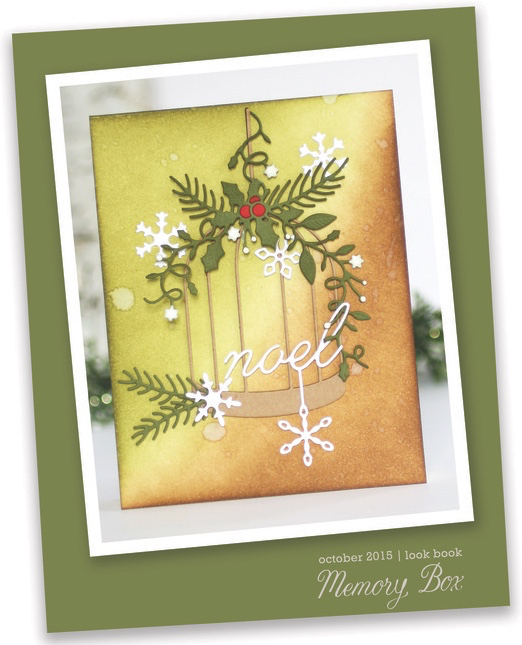 This makes me want to dig out the holiday stuff again – love it Pam!! Your snowman is cute, but hopefully we will not see any more snow I am ready for spring. Nice spring like Day today. The swans are back on bay starting to hear more birds hopefully this warmer weather is here to stay. So cute. Love ho you matched the paper. The tag is wonderful too. 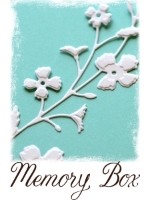 What a darling card, like the patterned paper, cute tag too! Ha! Too cute not to post or play with, for sure! I love your pail hat! Cute tag! And the plaid paper… some things are definitely staples, true. I have a few go to dies and things. Might as well just leave them out on my table, sheesh. 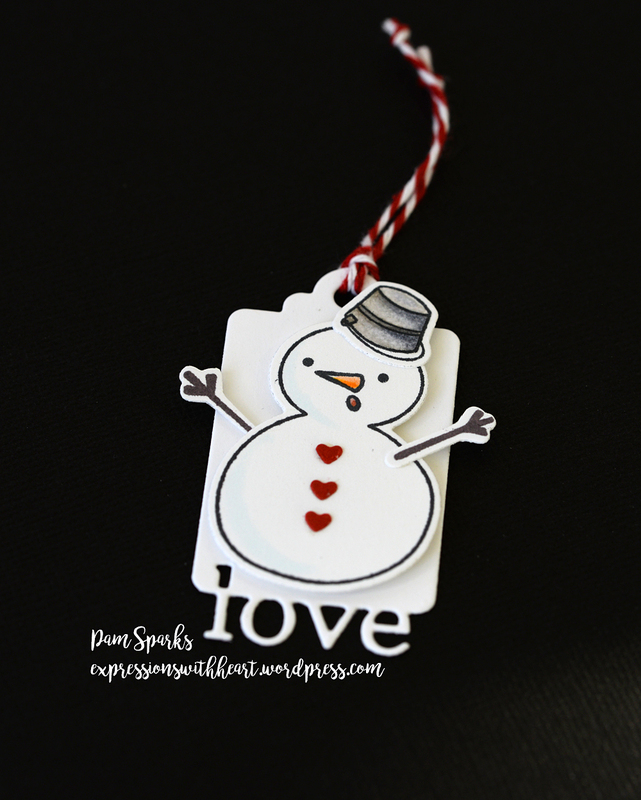 I love a cute snowman – even in June!!! Keep them coming, Pam! And by the way…you had me at plaid 🙂 Love these cute creations! Such cute snowmen! Love the pail! Hopefully the snow will be gone when I get home. I can only wish! Heeheee! Oh those are so cute! 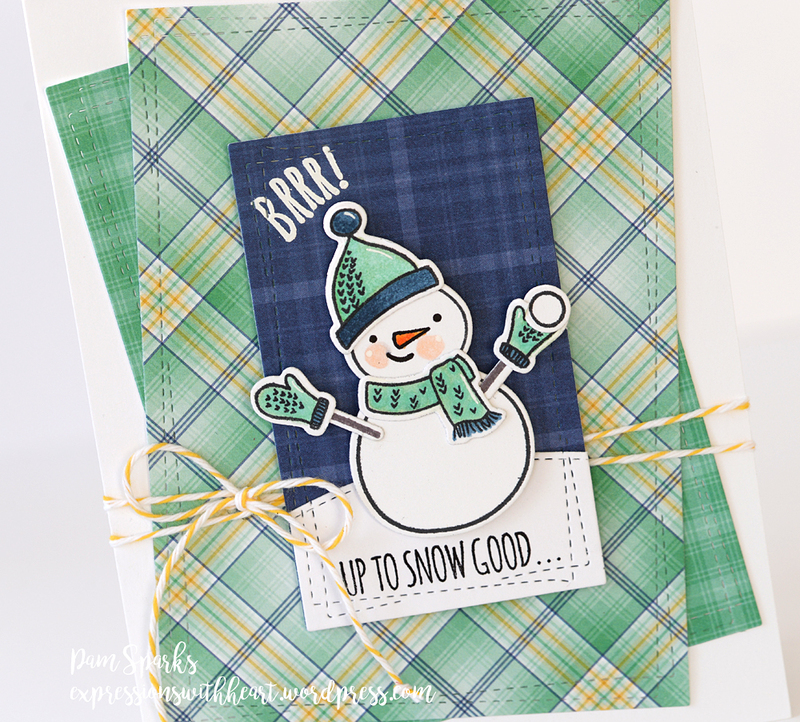 I love that plaid paper! A perfect fit for that snowman! Love them both! Cute as can be! 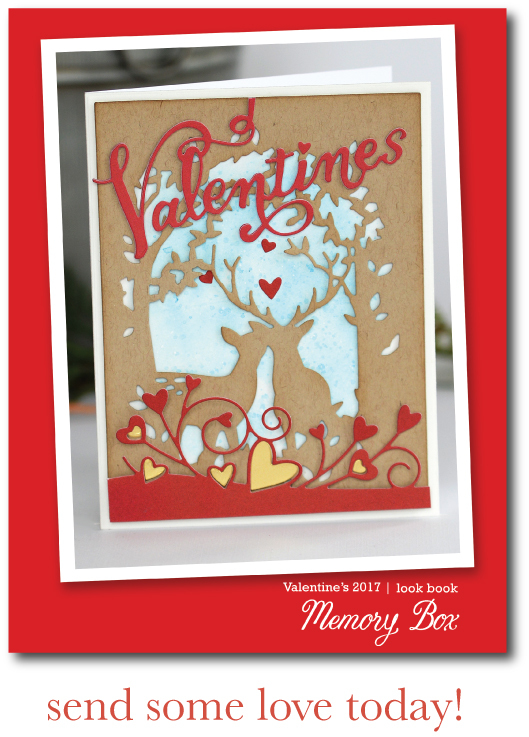 Love the patterned paper you chose! And you know the old saying “you can never have enough snowmen cards” …. well that’s my old saying anyway! haha! I love snowmen year round! The little tag is adorable too! 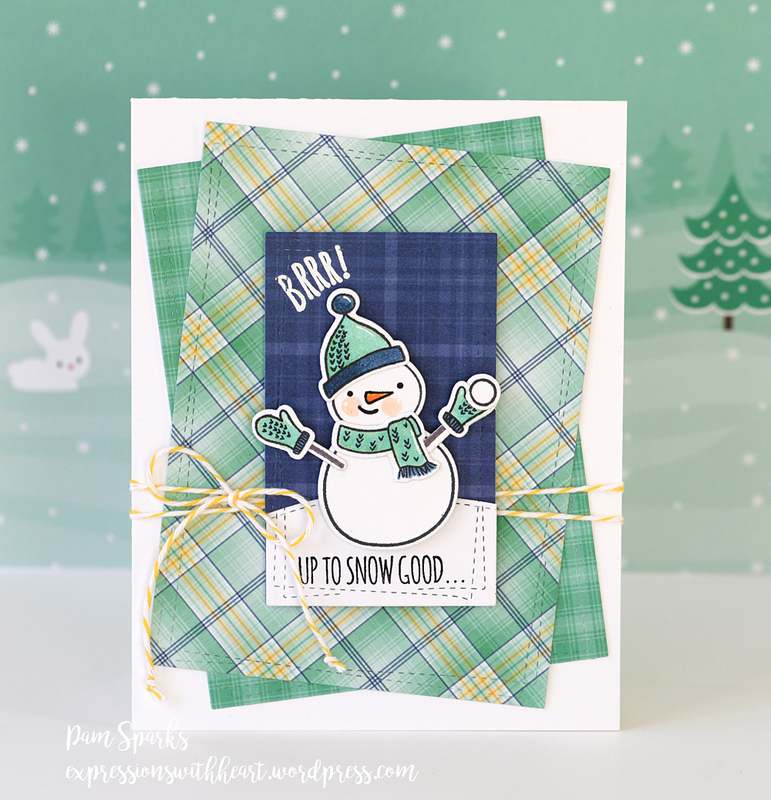 I love snowmen and I love that background paper too!!! Two cute and fun tags, and your plaids are beautiful on the first!